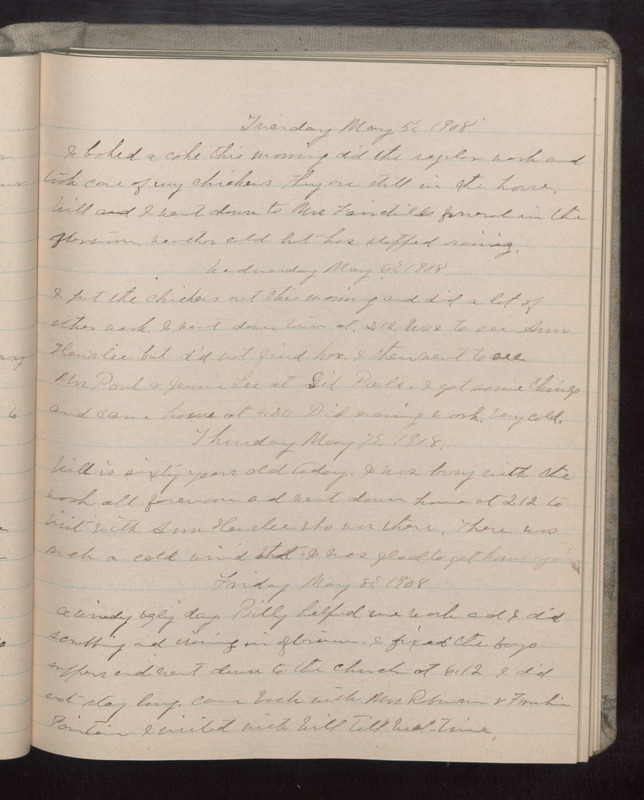 Tuesday May 5 1908 I baked a cake this morning did the regular work and took care of my chickens They are still in the house. Will and I went down to Mrs Fairchilds funeral in the afternoon. Weather cold but has stopped raining. Wednesday May 6 1908 I put the chickens out this morning and did a lot of other work. I went down town at 2.12. Was to see Ann [Hensler?] but did not find her. I then went to see Mrs Paul & Jennie Lee at [Gil Pauls?]. I got some things and came home at 4.30 Did evening work. Very cold. Thursday May 7 1908 Will is sixty years old today. I was busy with the work all forenoon and went down home at 2.12 to visit with Ann [Hensler?] who was there. There was such a cold wind that I was glad to get home again. Friday May 8 1908 A windy ugly day. Billy helped me wash and I did scrubbing and ironing in afternoon. I fixed the boys suppers and went down to the church at 6.12 I did not stay long. came back with Mrs Robinson & Frankie [Pointoin?]. I visited with Will till bed-time.